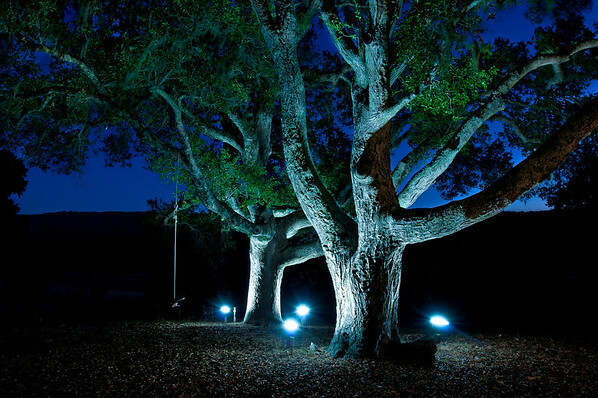 We arrived in Paso Robles on Friday and got in touch with one of my cousins who lives down there. He was taking his son to a car show and said he would meet up with us later to show us their house. After the car show ended he swung by the hotel and said "I'll be the one in the Aston Martin." We assumed he was joking (since he was just at the car show) but it turns out he was serious! 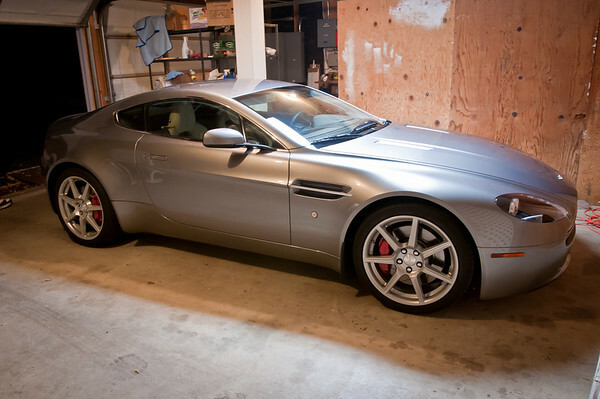 Here's his Aston Martin Vantage in his garage at home! 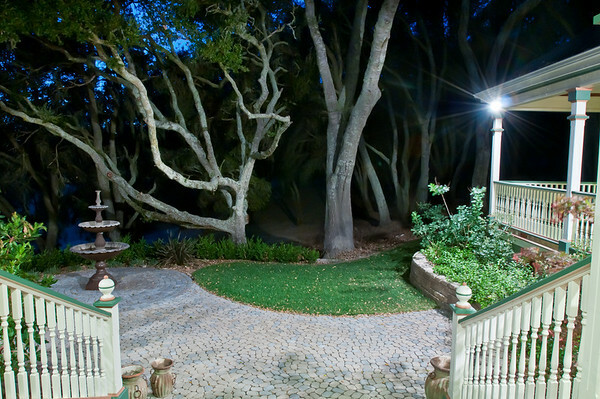 This is my cousins house on his 47 acre ranch! They breed horses here too. The house was gorgeous! The view out the back of their house. This is aparently one of my cousins favorite views, although they had the trees trimmed and the trimmer cut a bunch of branches they weren't supposed to cut and my cousin has been very sad. Saturday morning we signed up for the Experience Tour (Tour #1) at Hearst Castle. We arrived to a cloudy, dreary morning where you couldn't even see the castle from down below! You can see it's completely white above the visitors center. 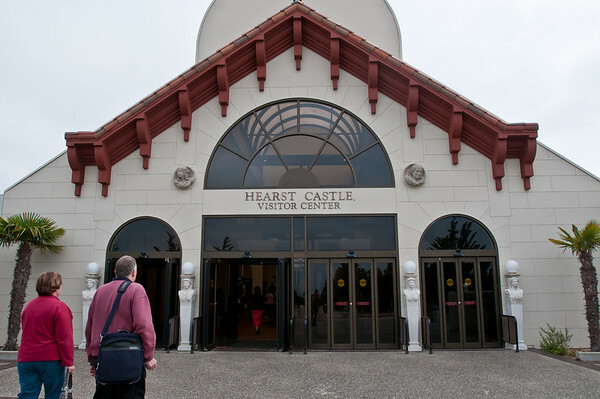 From the visitors center you take a bus up to Hearst Castle. It takes up a steep and windy road that used to be part of the Hearst Castle Zoo (Yes, Hearst had a full zoo on his property)! 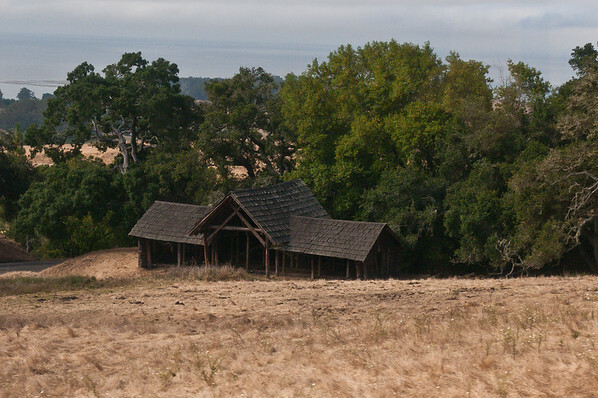 On the way up to Hearst Castle we passed by one of the old cabins. I forget what this was used for. The first stop on the Hearst Castle tour is of one of the guest houses (yes, this is a guest house and not the actual Castle!). 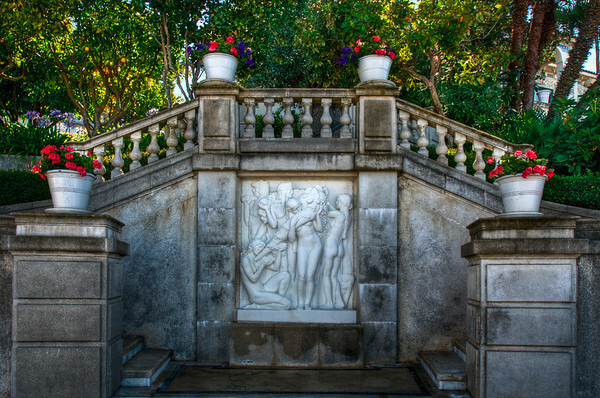 A neat looking staircase as you walk up to the entrance of Hearst Castle. Hearst was very big on importing old European "things" (like paintings, sculptures, artwork, fresco's, ceilings, walls, etc). The famous Neptune Pool, as you walk up to it. It started out as a teeny pool and expanded into the gorgeousness that it is today! One of the things that I've found is most helpful is to make friends with as many "important" people as you can. On the tour they have a tour guide at the front who does all the talking and a tour guide at the back who makes sure everyone is ok and nobody gets lost. I decided to chat up and make friends with the tour guide in the back. Throughout the tour she would shoo people along and then let me stay so I could get a photo without people in it, or she would open a random door and say "here, take a picture of this room, nobody's in it!" 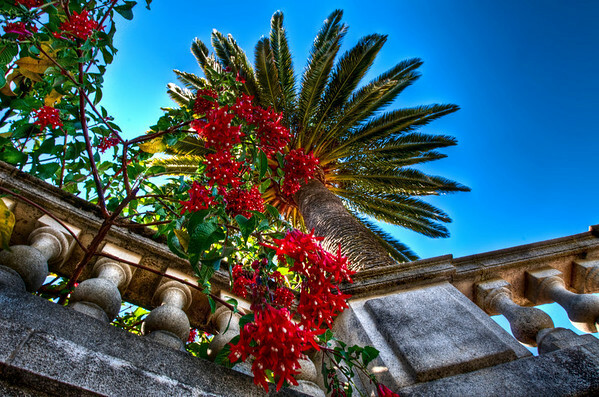 She pointed out this perspective to me and I thought it was neat, the way the railing drew the eye along, the palm tree spread the eye out, and the flowers pulled the eye up. 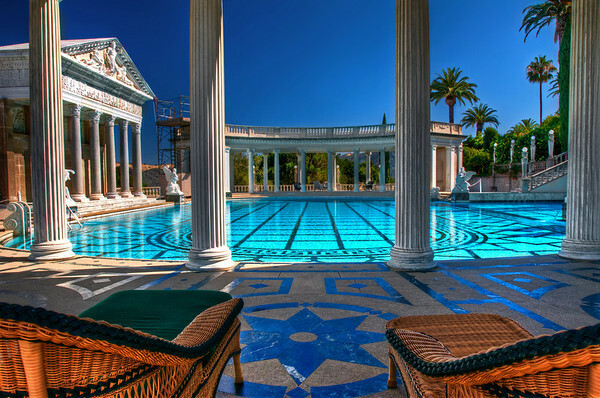 The famous Neptune Pool! 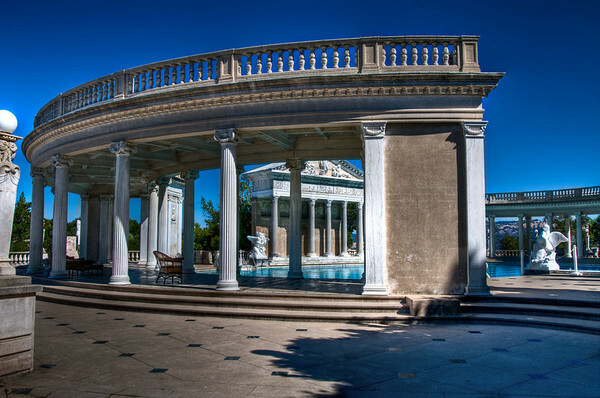 The Neptune Pool patio features an ancient Roman temple front, transported wholesale from Europe and reconstructed at the site. 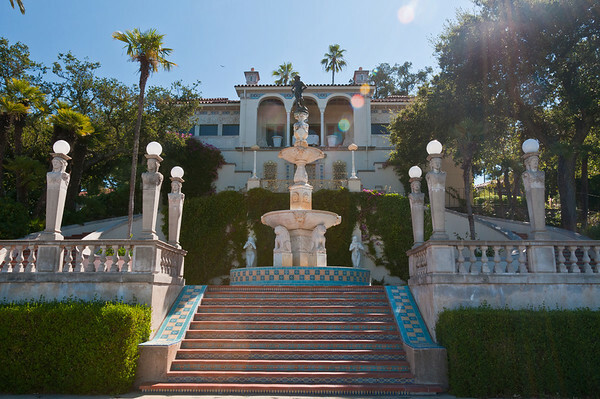 Hearst was an inveterate tinkerer, and would tear down structures and rebuild them at a whim. 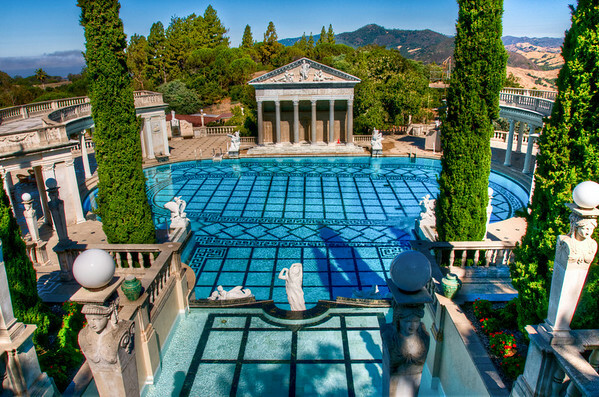 For example, the Neptune Pool was rebuilt three times before Hearst was satisfied. It is fed by mountain water and is surrounded by ancient Roman style columns and statues. Designed by architect Julia Morgan, the Neptune Pool was started in 1924 and was finally completed after several redesigns and re-buildings in 1936. Why don't you relax on a pool share and enjoy yourself by the Neptune Pool! The famous Neptune Pool! The Neptune Pool patio features an ancient Roman temple front, transported wholesale from Europe and reconstructed at the site. 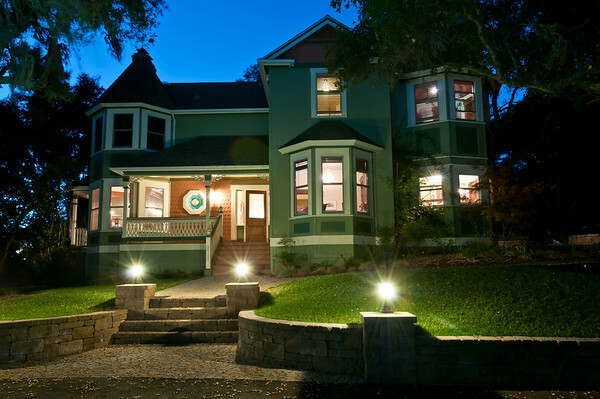 Hearst was an inveterate tinkerer, and would tear down structures and rebuild them at a whim. 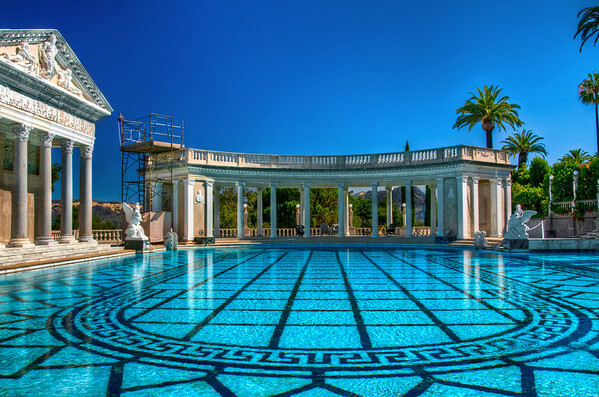 For example, the Neptune Pool was rebuilt three times before Hearst was satisfied. It is fed by mountain water and is surrounded by ancient Roman style columns and statues. Designed by architect Julia Morgan, the Neptune Pool was started in 1924 and was finally completed after several redesigns and re-buildings in 1936. 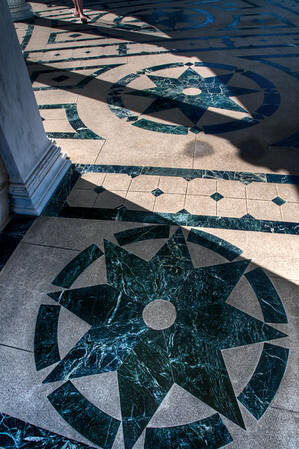 I thought the marble floors by the neptune pool were neat so I snapped a picture of them! 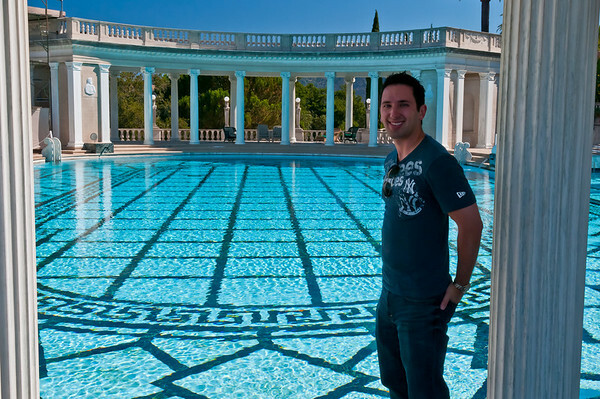 Me, in front of the Neptune Pool. Proof that I was actually there! The view of the entire Neptune Pool, from above. You can see the Roman temple and the neat columns.